For decades, the Mint Museum has been committed to sharing its art with the larger community—that means installing large works of public art around town for all to enjoy. For many decades, the Mint has kept its commitment to sharing its art with the larger community. From the heart of Uptown to the campus of the University of North Carolina at Charlotte (UNCC), the Mint has installed significant works from its collection in public spaces. Installed on the UNCC campus, Kanturk is a large scale sculpture composed of a single geometric column that has been twisted upon itself into a complex interlocking form. John Henry's large steel sculptures draw upon the vocabulary of 1960s Minimalism and also look back to the history and philosophies of Russian Constructivism of the early twentieth century. Suntarget, on the UNCC campus, draws its energy from both its bright yellow finish and the way in which it unfolds energetically across space, making the heavy beams out of which it is constructed appear weightless and playful. Arnaldo Pomodoro is an internationally-celebrated contemporary Italian sculptor whose works can be seen at locations ranging from the Virginia Museum of Fine Arts (Richmond, Va.) and the Hirshhorn Museum and Sculpture Gardens (Washington, D.C.) to the United Nations Headquarters (New York, N.Y.) and the Vatican Museum (Rome, Italy). 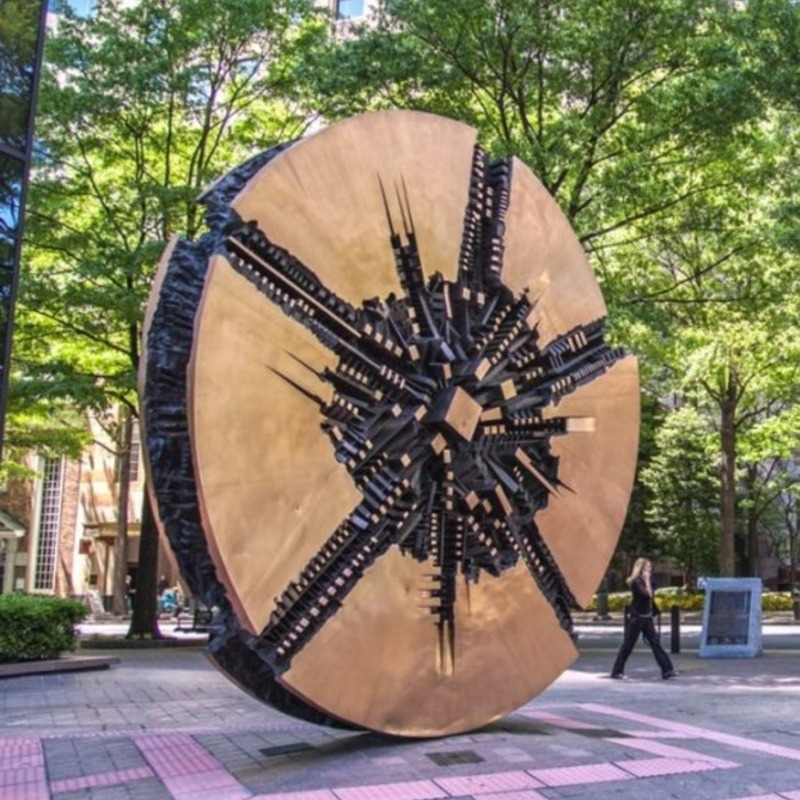 Many of his sculptures are in the form of spheres and discs and like Il Grande Disco (at the intersection of Trade and Tryon Streets in Uptown Charlotte), contain a contrast between their smooth golden exteriors and their rougher, darker interiors, suggesting a process of self-destruction and regeneration. This extraordinary gift to the people of Charlotte was made possible by the vision, drive, and leadership of Hugh L. McColl, Jr. exemplifying corporate generosity towards the Mint and the arts in our great city. Alfredo Halegua's monumental sculptures draw upon the language and materials of Minimalism but are frequently composed in such a way that they encourage viewers to experience them in the round and to think about such issues as weight, balance, and positive and negative space. Monument to the Unknown was acquired by The Mint Museum four years after it was made and installed on the campus of UNCC in 1984. Gandy Dancer commemorates the workers who built America's railroads; its name comes from a slang term for the workers whose origin is unknown (though a common explanation suggests the motion of the workers implied dancing and their tools were said to be made by a company named Gandy). The sculpture depicts, in glass and bronze, five figures in different stages of motion that represent a single worker driving a railroad spike. The artwork is in the atrium lobby of the CATS Light Rail Facility at 3200 South Boulevard and is visible to passengers riding the LYNX Blue Line as light rail cars go by outside its windows.